The conference will be organized in Budapest, the capital of Hungary. Well-known for its beautiful landscape, historic sights, thermal baths and vivid nightlife, the city offers much to see and do for everyone. Budapest offers the unique ruin pubs experience, with many different places to drink a beer. Browse them here! Budapest is also well-known for its bathing culture. The baths offer an excellent opportunity to unwind and relax after a packed day of conference sessions. Have a look at our baths and spas! 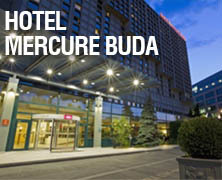 The conference will be held in the four-star Mercure Buda hotel.